THIS IS THE OLDER VERSION OF THE STACKER. PLEASE SEE THE NEWER VERSION HERE. 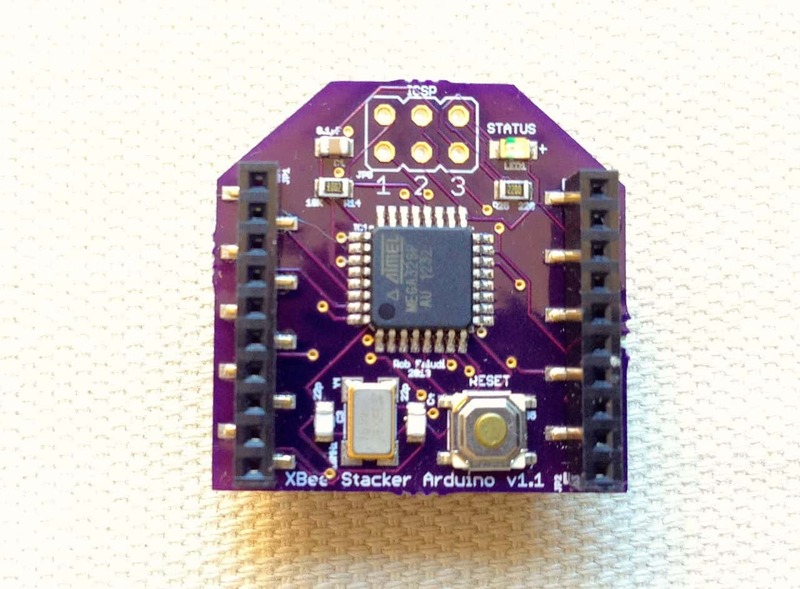 This new project creates XBee radio-sized components that can be “stacked” directly underneath the radio. 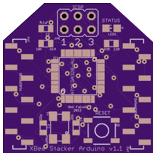 Each Stacker will add additional features like microcontrollers and sensors for devices that already use the XBee’s 20-pin footprint. The goal is to create plug-and-play tools for prototyping new concepts that extend the popular radio’s feature set. A few iterations have created a prototype that works great! The first design is an Arduino-compatible board the size of an XBee that fits right underneath the radio, creating a Arduino-programmable XBee. 17 capacitor Arduino Reset (p1) via cap. This XBee Stacker can be programmed wirelessly using an Arduino setup first prototyped by me, then greatly improved by Limor Fried and later Shigeru Kobayashi. I’m borrowing it back now, thanks everyone! Arduino (technically AVR Dude) opens the local serial port, automatically bringing the RTS line low. The RTS line is connected to pin DIO3 on the local XBee Explorer so that pin it goes low in tandem. 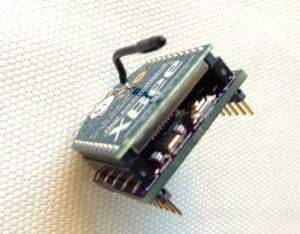 The local, base station XBee has pin DIO3 configured as a digital input, and sends that low state to the remote XBee, the one plugged in to the XBee Stacker board. 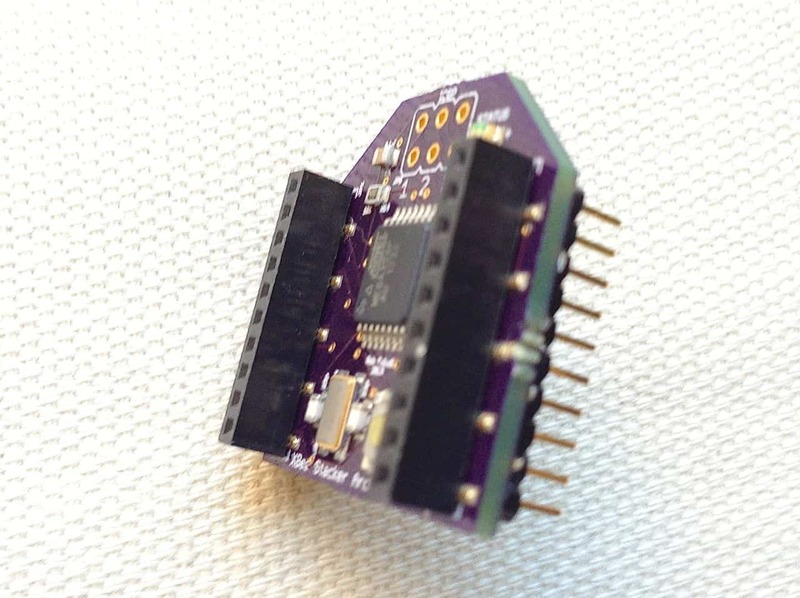 The remote XBee has pin DIO3 configured as a digital output, initially high. When it receives the low state from the base station XBee, its own DIO3 goes low too. DIO3 on the XBee Arduino Stacker is connected to the Arduino microcontroller’s reset line, but via a capacitor so only a burst of the low signal gets through, just enough to reset the microcontroller. The reset microcontroller goes into bootloader mode and accepts your new Arduino sketch over-the-air, then begins running that new sketch. All by itself and without wires! If you are using CoolTerm or another Serial Terminal, use ATWR to save the configuration to your XBee’s firmware. After you change their baud rate the radios will no longer respond at 9600 baud. Be sure to change the baud rate in X-CTU or CoolTerm to 57600 if you want to check or update their configurations. The “Base” XBee’s DIO3 and RTS pins need to be connected together. 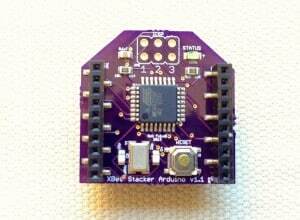 If you are using an XBee Explorer, simply solder a jumper or wire between these two pins. 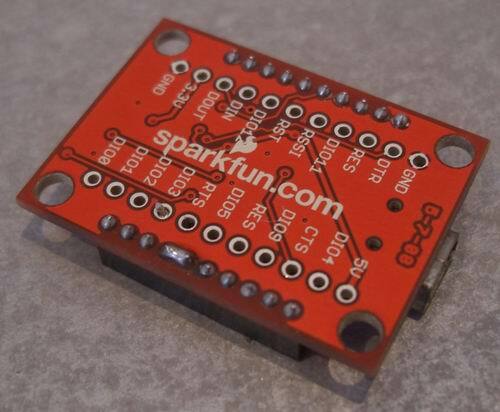 Nate at Sparkfun shows the solder jumper you will need. Connect your “Base” XBee into the modified XBee Explorer USB (or your own adapter) connect it to your computer with a USB cable. Stack your “Remote” XBee onto the XBee Arduino Stacker and provide it with power (a second Explorer or XBIB is an easy way to power it for tests). Select “Arduino Uno” in the Tools:Board menu and select the correct serial port from the Tools:Serial Port menu. Open the sketch you’d like to upload. Should you get an error message, try again in case it’s just a one-time glitch. Next carefully recheck each connection and configuration item, one at a time. It’s very common to get something set wrong the first time you try this so go through it methodically and patience will pay off. Not determined although open source hardware is top of my list right now. Very nice project, do you think there is room to fit Humidity, Barometric pressure and Light sensors in the same board ? Yes, it could probably be done. Although it might make more sense to do sensors as a separate board so that the selection of I/O and of microcontroller could be kept independent.